Since today is Good Friday, I thought I would review two of my favorite Easter movies. The first is really more of a Passover movie than an Easter movie, but since Passover is a depiction of Christ's atoning sacrifice for His people and since, of course, this IS Passover, too, I feel it is especially appropriate. I'll be the first to admit I am a sucker for old movies, especially old movies in the style of the great Hollywood studios. 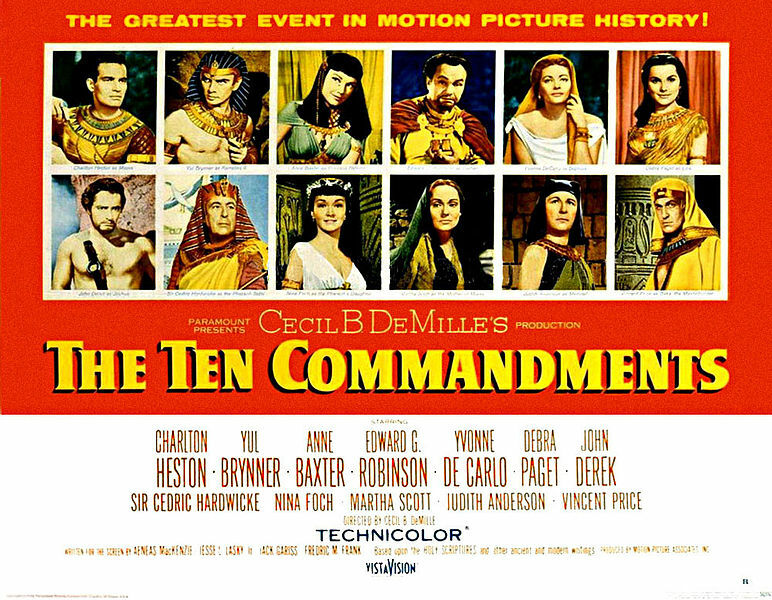 One of my favorite movies of all time is the 1956 version of The Ten Commandments. Yes it's sometimes pompous and silly and often overwrought, but how could you resist that all-star cast? 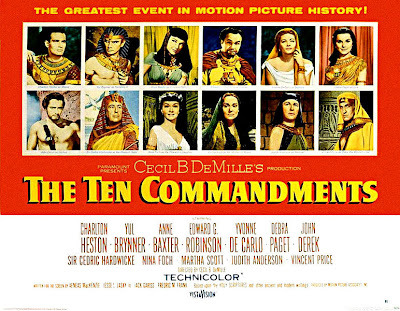 Charlton Heston as Moses, Yul Brynner as Rameses, Anne Baxter as Nefretiri, Edward G. Robinson as Dathan, Yvonne De Carlo as Sephora, Debra Paget as Lilia, Judith Anderson as Memnet, Vincent Price as Baka, and John Carradine as Aaron. I always especially enjoy Sir Cedric Hardwicke's sly performance as Seti and John Derek's earnest Joshua (maybe just because he was SO cute). The movie is lush and always a visual delight and seeing death itself pour into Egypt's streets to claim the firstborn always chills me. And, after the dramatic parting of the Red Sea and Rameses' defeat, I love to hear his grudging declaration concerning Moses' triumph: "His God IS God." The other movie I would like to review is Jesus of Nazareth. Filmed in 1977 as a miniseries, it was directed by Franco Zeffirelli, and his touch shows in the lavish sets and costumes. 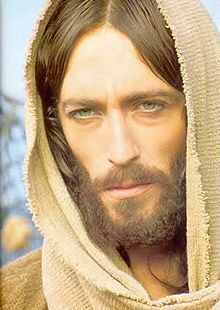 Jesus is portrayed by Robert Powell, blue eyed and ethereal, not exactly Jewish, but his performance is touching and memorable. I particularly enjoy Olivier's Nicodemus as he puzzles over what it means to be born again. The crucifixion scene, though I'm certain not as harrowing as the one from The Passion of the Christ, is certainly brutal and heartbreaking enough. And when they take Jesus from the cross, in the pouring rain and His mother wails out her grief, I am always touched by Mary Magdalene kneeling silently in the mud, kissing His feet. Of course, there are many movies depicting Jesus' life, death and resurrection. Ben Hur is another in grand Hollywood style. And King of Kings with Jeffrey Hunter is also a favorite. Of course, Hollywood never seems to get everything exactly right, but this is truly the greatest story ever told, and it has power no matter how imperfectly it is portrayed. I hope I'll get a chance to watch both of these movies this weekend. What are your favorite Easter movies? Oh DeAnna, I love The Ten Commandments. Dare I say it, I have a sort of ironic love for it. It is a bit campy, with its va-va-voom ladies and extreme seriousness and the way Nephertiri says "Moooo-sess". But it's such a fun movie, and you're right, when Death comes, it's chilling. Same with the scene toward the end with the Phaoroh's son dies. I watch it every year. I think Yul Brenner is far hunkier than Charlton Heston, though. Just sayin'. I haven't seen Jesus of Nazareth in years! I'll have to look for it this weekend. Yes, it's very campy and very 1950-ish, very glitzy and not the least bit subtle, but it's great fun. I haven't seen either of those two movies in years. YEARS!!! I ought to show them to my kids. We watched Fiddler on the Roof last week. The 1968 version. It was campy. But I was amazed at all the references to God and faith. Yeah, Gina, one thing I like about this Ten Commandments is that, despite the campiness, God is revered and shown to be powerful, and His people are shown to be good and strong and there is such a thing as right and wrong. I think I mentioned a while back that Keith loves the Ten Commandments so much he watches it every year. So I know I've seen it at least 32 times, that doesn't account for how often I saw it as a kid because I know my parents watched it, too. And the movie with the blue-eyed Jesus. My dad loves this one so I saw it a lot as a kid and I loved it. As I grew up to discover Jesus probably (most assuredly) didn't look like that, it didn't matter. I still enjoyed it. Keith watches this one a lot, too, but not as often as the other one. Fun, DeAnna. I love the cast re-cap. I don't remember Michael York as John the Baptist. Yeah, it's been a while since I've seen either of these, Suzie, so I was surprised by some of the cast, too. Gotta make time to watch soon.